Hello guys! This is Arca, and the reason I did not get to post at all yesterday was because I had swimming right after camp. I will make two posts tomorrow because of this. 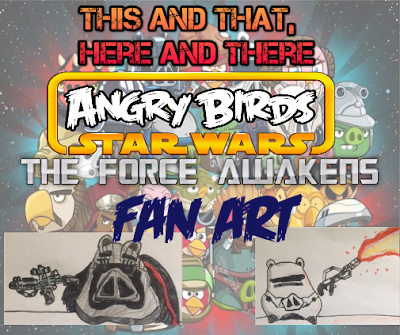 According to the last Google+ poll, the two Angry Birds Star Wars: The Force Awakens fanart drawings you wanted to see me make next were Captain Phasma pig and Flametrooper Pig. 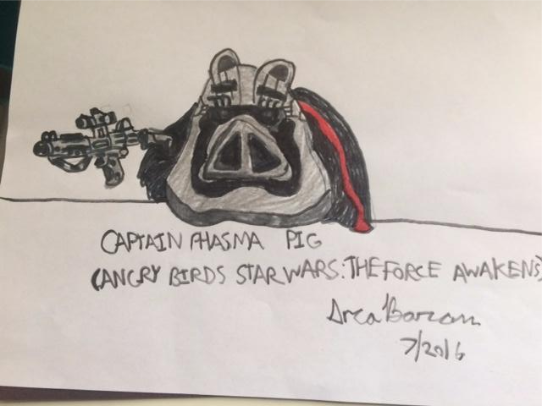 Originally, I didn't want to draw Captain Phasma as a pig. I had already made a First Order Stormtrooper Pig, and thinking that Captain Phasma was almost the same thing, I didn't want to have to redraw it. But I later realized that not only is Phasma silver with a cape, but she has different helmet features and a different weapon. Anyways, without further ado, let me show you the drawings! Captain Phasma Pig is mostly silver and grey. She has the same First Order stormtrooper eye holes and mouth outline connecting to her pig snout. Since she is female, if you look closely enough you will see eyelashes on top of the eyes and below the eyebrows. The eyes and mouth have a black covering and her eyelashes and eyebrows are black, as well as the inside of her ears. The bottom of her helmet is darker colored than the rest. Her cape is mostly black with a bit of red. Her blaster is slightly different than that of the First Order stormtrooper's blaster, since hers is longer, has a different handle, and is silver with more details on it. If you look closely, you will see that the place where the lasers come out has two holes resembling a pig snout and two ears on top. My Flametrooper Pig has two silver parts at the bottom of his helmet, a bit of black below where his head's neck would probably be,and lines on the helmet connecting to his snout. The place where there is an opening for his eyes is a thing grey line ( and you can see dots for his eyes) with a slightly thicker black line above it. The inside of his pig ears is dark grey and there is shading all over his body and a bit of orange reflection next to the flamethrower. I drew the flamethrower with minimal detail with fire coming out of two piggy snout holes on the end. I hope you enjoyed. Thanks for reading this. Stay tuned for tomorrow's two posts, and a post every day of the summer. I will see you next time!!! BBYYYYEEEEEEEEEE!!! !